The seventeenth century is in all respects the golden age of Spanish painting. Italian influence was largely rejected in favor of Mannerist formulas and a severe and noble style which used chiaroscuro not for the sake of a theatrical aestheticism, but to create a more urgent sense of drama. Though undoubtedly Baroque, this was a profoundly realistic art, preferring a broad visual synthesis, with a predominance of pictorial over tactile values, to the analytical approach of the sixteenth-century primitivists. Interest in the faithful reproduction of materials encouraged virtuosity. Artists grew more fastidious in their choice of colors and more intimately concerned with tonal values. Light served not only to lend brightness to external forms but acquired a transcendental function. Spatial values became more subtle and more numerous; tonal gradation gained in importance and the conventional mode of observation gradually gave way to one so penetrating that no other age or style has been able to equal it in truthfulness. It was, in fact, the great Spanish masters who guided European painting along the paths of naturalistic realism. The new art remained faithful to the themes of the preceding century: pictures of religious subjects continued to predominate, but the patronage extended by the Hapsburgs to the more famous artists resulted in the execution of numerous royal portraits, as well as paintings of historical events and scenes from private and court life. In the best work of this period a superb elegance of gesture and a psychological profundity are combined with a splendid harmony of tones and colors. It is a style that strikes a perfect balance between the graphic and the pictorial, between the representation of detail and a suggestion of the imperfections of human vision. 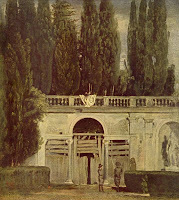 The principal schools of this period were those of Seville and Madrid, the latter enjoying the patronage of the court. Initially, there were other important schools at Valencia, which maintained contact with Italy, and at Toledo, a training center for painters who later worked elsewhere. The first painter to abandon Mannerism for the new realistic style was Francisco Ribalta (1555-1628), a Catalan who, after receiving his early training in Toledo, spent the years of his maturity in Valencia. 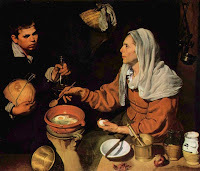 It is not known whether Ribalta was acquainted with the work of Caravaggio or whether he arrived independently at results parallel to those achieved by the Italian Tenebrists. At all events, his style is remarkable for its virile naturalism. The brushwork is increasingly bold and free, so different from the polished smoothness of the previous age. Ribalta sought expressiveness as well as beauty and accentuated the sculptural modeling of h is forms by contrasting light and shade. It is with José de Ribera, however, that Tenebrism really triumphs. Ribera (1591-1652) was trained in Valencia, but in about 1616 he moved to Italy, settling in Naples. A clever draftsman and a master of composition, his numerous paintings are more varied than the legends concerning him might lead one to suppose. In his better work the dominant colors, browns and reds, contrast with cruel lighting, which sometimes appears to do violence to the forms. The culmination of Spanish seventeenth-century painting, and one of the climaxes of world art in general, is reached in the work of Diego Rodriguez de Silva y Velázquez (1599-1660), an artist whose mastery of space and light was admirably served by an impeccable technique. Born in Seville, he received his first lessons from the daring Francisco de Herrera the Elder, but soon became apprenticed to Pacheco, with whom he worked for five years, eventually marrying his daughter. In his writings Pacheco recalls how Velázquez was always extremely exacting in his technique and eager to work directly from life, preferring figure studies and genre scenes. Even the earliest works of the master are characterized by relatively dense impasto, objectivity of vision, restraint in the use of color, mainly ochers and browns, and simplicity and naturalness of conception. The art of Velázquez developed irresistibly in the direction of ever greater synthesis. He painted the reflection of light in forms and colors rather than the forms and colors themselves; his drawing, such is its perfection, appears to illuminate his figures and details from within. This precision of outline, this subtle blending of tones and colors, this intervention of atmosphere between the eye and its object do as much to define the style of the artist as his simple and profound respect for everything in nature. A free and comprehensive vision of a ll the elements of reality, men, things, landscape, and, not least, the spirit, blazes forth in one of the masterpieces of his middle period. 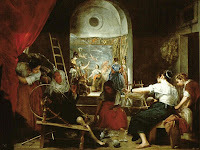 The painter's interest in portraying light was not the result of a preoccupation with technique, an attitude foreign to the aesthetics and even the optics of the seventeenth century, but developed out of a profound, inner religiosity, which had always been part of the Spanish tradition and was now to find new and vigorous expression. Born in 1598 in Estremadura, Francisco de Zurbarán received his training in Seville with the painter Diaz de Villanueva. In spite of his wholehearted adherence to the Andalusian school, he remained Estremaduran by temperament, superimposing a natural asceticism and a certain rustic simplicity on southern grace and elegance. Although completely faithful to his own emotions, in his naturalism and intense chiaroscuro Zurbarán clung to a certain archaism that made him the most restrained and purest of the artists of the Spanish Baroque. Shortly afterward he signed a contract to paint series of compositions for several of the monastic orders of Seville who were his most important patrons. 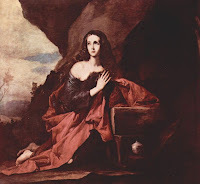 Another important series was painted for the Jeronymites of the monastery of Guadalupe (1638-1639). Here the mood varies from a vein of realism to visions of miracles and scenes of contemplation in which the mysticism of the great Estremaduran artist has mingled with his colors. Zurbarán was also a master of simple themes, solitary figures, static and somewhat tense, saints with their eyes raised to heaven, and genre paintings in which everyday objects are clothed in mystery, as in the still life of 1633. In Spanish painting, and within the Andalusian school to which he also belonged, Murillo represents the height of elegance and delicacy, and, it must be added, the greatest surrender to popular sentiment. His art was always at the service of his theme, and the the me, in turn, was relived with fervor. In the fervor, however, profundity was often ignored in favor of more brilliant, but aesthetically less satisfying qualities. Murillo was as sensitive to feminine beauty and the beauty of children as to the subtleties of color and tonal gradation made possible by the advanced technique of the Baroque. 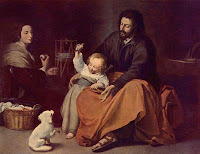 Lyrical rather than dramatic, Murillo was by no means unaware of the prevalence of social unrest, reflected in literature in the picaresque novel, and his whole approach to religious painting was based on a realistic point of view.